When you aren't supposed to win, it's hard to know what to do when it happens. Take 18-year-old Bianca Andreescu and her historic win this past weekend at Indian Wells. She is the first wild card to ever capture the event, the most prestigious tournament ever won by a Canadian singles player. There was no fancy meal or waiting champagne, even if she isn't yet old enough to drink it. But after completing a dizzying press conference, Andreescu and her coach had to eat. "I celebrated with a good In-N-Out burger right after I got off the site," a still giddy-sounding Andreescu told international reporters Tuesday during a conference call from Miami, where the Mississauga, Ont. teen will play her opening match in the Miami Open on Wednesday. Andreescu is starting to realize how success will undoubtedly alter her life. People know who she is. "I'm getting way more attention than usual. People are coming up to me that I didn't expect would come up to me," she said. Even tennis royalty has taken notice. "It was definitely overwhelming to have so many amazing champions congratulate me and recognize me. But I think the one that stood out the most was Rod Laver. And Billie Jean King for sure." A star is born, congratulations @Bandreescu_ what a fighter you are. 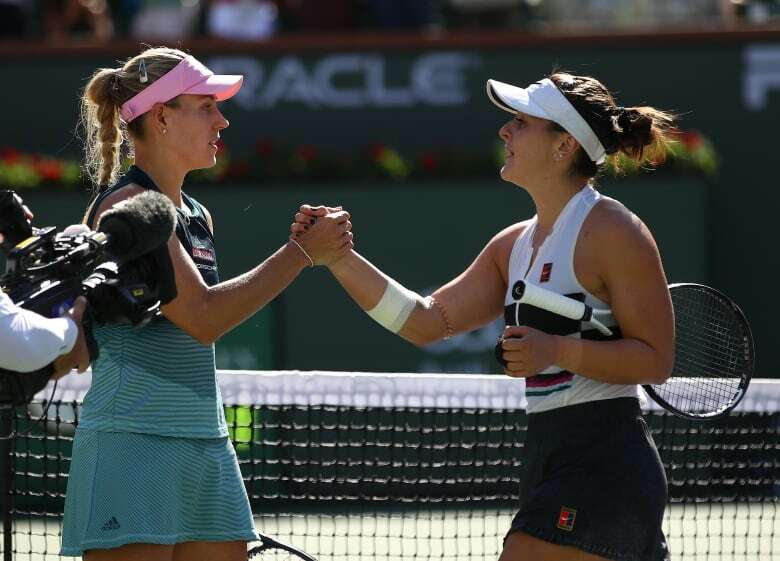 Andreescu was asked again Tuesday to recount how she fought through physical pain and willed herself to victory at Indian Wells. It's an inspiring story no doubt. But Andreescu knows it's not a narrative that will lead to sustained success. She says getting stronger — both physically and mentally — is something she's committed to. "I've never been in situations like that before. I've never been in the finals of a premier event against a very high-level opponent," she said. "So I think it was also all of the emotion of the tension that was going through my body that caused me to get even more tired than I usually would have. "But I'm definitely seeking help for that. I've been running some tests to see what the problem is. But definitely after Miami I'll take a good two or three weeks of just figuring out what to do better with my body and my nutrition and my mind." But for now there is the Miami Open to play, another grueling WTA test featuring the tour's top players. People will be looking to see if Andreescu can build off her surprise result at Indian Wells. Whether she can deal with the pressure that comes with winning. Retired Canadian tennis player Aleksandra Wozniak can relate. She won her first tournament in 2008 and reached as high as 21st in the world before her career was derailed by injuries. "You're really busy after such a big win and there's so much going on and a lot of people want a piece of you," Wozniak told CBC's Metro Morning. Wozniak says you want to do all you can to sustain the momentum. "It was the pressure I put on myself because I was doing well and then I wanted to do even better. And then, of course, this pressure from the outside — your coaches, people's expectations." Wozniak says sometimes it can hard for players to actually enjoy what they have accomplished. "Remember your roots, the people who were the very first ones to believe in you, because there'll be all kinds of people after [you win] coming to you or trying to distract you." Freshly minted as the 24th-ranked player in the world, Andreescu appears to be heading into Miami undaunted, focused and convinced she can continue to win. "I am getting more and more experience and getting more and more confidence playing against these top-level players," Andreescu said. "I'm definitely not starstruck with who's on the other side." After Miami, Andreescu has committed to some needed rest. Beyond that, her recent run of success has already altered her schedule. "From the beginning of the year, my goal was to get into the main draw of the French Open and I already accomplished that. So now I have to sit down and re-evaluate my goals with my coach." A nice problem to have.